I shared my condo decluttering story a few days ago and did what Marie Kondo wrote on her book– I discarded what I don’t need and use. So what to do with the things that don’t spark joy anymore? I’m letting them all go! 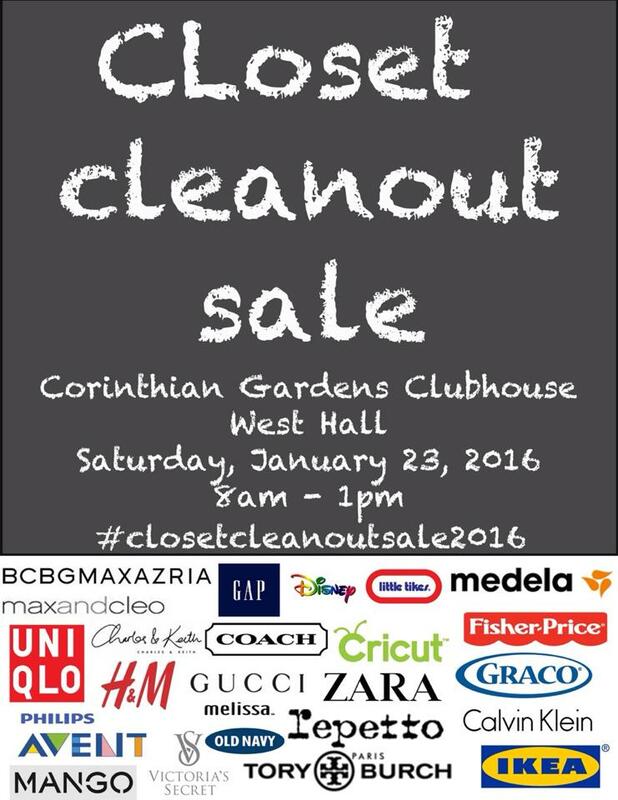 Come and visit my booth this Saturday, January 23, 2016 at Corinthian Gardens Clubhouse. Full details on the poster below. I have a lot of clothes to let go. Brands such as Zara, H&M, Mango, J.Crew, COS are up for grabs and some are even new with tags. I’m letting them go for the price of P200-P300 because it’s such a tragic thing seeing them piled up in storage. I’d rather let them go for a fraction of the price I originally bought them so that others may use them. If you’re a size 7 1/2 or 8 you’re also in luck, I’m selling a few pairs of shoes too for the price of 300-P500 some are brand new and still kept in their respective boxes. To give you an idea, some of the items I’ll be selling include a black dress, white pumps, and full skirt. I’ll also be selling some of my children’s toys all at bargain prices. I just need to let them go! My fellow mommas and I cannot wait to see you all! I hope you find something you like so you can breathe new life to the things that no longer spark joy for me. Once it sparks joy for you, go ahead and grab it okay? 😉 See you this Saturday!